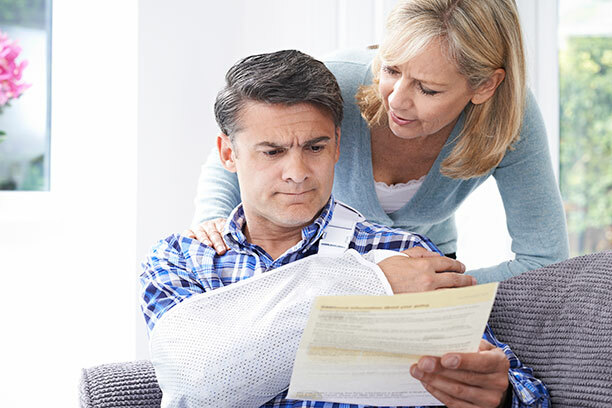 Benefits in General: If you are hurt or become ill off the job [as opposed to workers compensation benefits which apply to injuries or illness on the job] you can receive temporary cash benefits. The law provides that you can receive weekly cash benefits to replace lost wages. Insurance Premiums: Employers usually deduct the cost of such insurance from employee’s regular wage checks and an employee’s contribution usually does not exceed 60 cents per week. Claim Forms: You can file a claim with your employer or with the insurance carrier providing such benefits. You must complete Form DB-450. A portion of this form must be completed and signed by your treating physician so that the disability can be documented. Time Limits: You must file your claim within thirty  days of the date of your disability. No benefits will be paid if you file more than 26 weeks after your disability began. Covered Employees: You are covered if you have worked at least 4 consecutive weeks or if you work as a domestic or personal employee for 40 or more hours per week for one employer are also covered. You’re covered if you change jobs from one covered employer to another from the first day on the new job. Non-Coverage: The following persons are not generally covered: [a] Minor child of employer; [b] Government, railroad, maritime or farm workers; [c] Ministers, priests, rabbis; [d] Corporate officers; [e] Golf caddies; [f] Part time workers who are also daytime students in elementary of secondary school and other categories. Medical Care Costs & Exams: These charges and expenses are not covered under the NYS Disability Law. Insurance carriers providing benefits have the right to have the claimant examined by a physician if requested and a refusal to submit to an exam my jeopardize benefits. Unemployment Insurance Benefits: Generally, you cannot collect both unemployment insurance benefits and New York State Disability benefits at the same time. Pregnancy: If disabled on account of pregnancy, an employee may be entitled to up to 26 weeks of benefits. Disability can occur at any time during pregnancy. Auto Accidents: If you are involved in an auto accident, you may still be entitled to Disability Benefits. However, these benefits are usually coordinated with no-fault wage payments. Denial of Benefits: Denial of claims can be reviewed. Claimants should complete the Notice of Rejection form and mail within 26 weeks to the Disability Benefits Bureau at Workers Compensation Board, 100 Broadway-Menands, Albany, NY 12241. Tel:  474-6681. Recommendations: Make copies of all forms submitted. Obtain proof of mailing [green card, certified] from the US Postal Service.